Testimonies | Welcome to Dusten Lyvers' Official Website! I had a phone reading with Dusten and I am still in awe at the gift he has and incredibly accuracy. He is truly amazing, I have seen/meet with medium’s but never experienced a phone reading had no clue what to expect I was very nervous, then my mom came in and OMG the information he was giving me from her only she and I would know. And there was a weight lifted off my shoulders knowing she’s at peace. I cannot put into words how his gift has helped me feel with the decisions that had to be made on her behalf. Thank you Dusten I am so honored that you did my reading. 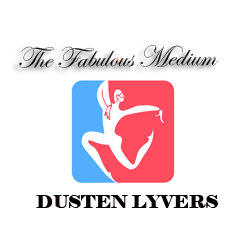 Dusten is one of the most authentic mediums that I have ever met. I did my homework and found Dusten by his credentials and his reviews. I have been to him twice and each time I am more amazed. He is very ethical and is truthful. He may be young, but he has a gift that goes beyond what age a person is. I had two readings quite some time ago, amazed at Dusten’s talent in both messages from the spirit world and in future things to come. In fact it’s time for another visit! First, let me start by saying that I waited about three months before I actually left a review. I think that Dusten’s ability to tap into the spirit world is amazing, and although I was a skeptic, many things that I was told in my readings have fallen true. He definitely has a gift, and I hope that he continues to develop it. I’m grateful to have had a reading with him, as he helped me to connect with my loved ones in the spirit world. Thank you Dusten. Dustin you were amazing. You not only gave me so much peace but my friends as well. I don’t know if you remember me, but I was the first sitter you read over skype during the medium cetification with Forever Family. We only had a short 15 minutes but it all meant the world to me. My friend had passed away only a few months before and you were able to channel him. Not only was I at ease after our discussion, but I was able to bring back those messages to his family and friends. Everything you brought up was so extremely on point that I could not sit still. I’ve always been a believer but you certainliy confirmed it. You are a wonderful individual and have so much passion and heart. I left that day not only feeling like I heard from a dear friend, but that I made a friend as well. Thank you for sharing your gifts with the world. Really, thank you. I am extremely lucky to have been a sitter for your test. Best of luck with everything life has to bring you. I have had 2 reading’s with this amazing guy! Both times My dad, my Brother n my son, John, came through.. I received the answer’s I was looking for as well as the comfort in knowing that they are still with me and know what pain their death’s are doing to me and how they send me sign’s. Through Dusten I am at peace as much as I can be. If I could have reading’s with you everyday I would!! The gift you have is so amazing, may you alway’s continue to be so in tune to the Spirit’s as well as us that help us with keeping in touch with our Loved one’s that have crossed over… Much Love and Gratitude for you always!!! Amazing!! Dusten is the real deal. He was spot-on with everything he said and captured my dad’s personality exactly, even my his playfulness. With Dusten’s help, I was able to reminisce with my dad and was even reminded of things I had forgotten all about. Dusten passed on advise from my dad that has been so helpful. I could not recommend him more, he has a wonderful gift and is willing to share it with the rest of us. Thank you, Dusten!!! BEAUTIFUL READING ♥♥♥♥♥♥♥♥♥♥ I had the best reading today! Not only did Dusten bring my Grandma & Grandpa through, but my Father and a good friend that passed!! What great things they had to tell me! He answered all the questions I had and helped me understand some things I had been questioning! He is a phenomenal Psychic Medium! Very caring, wise and a warm heart with a contagious laugh! Thank you Dusten Lots of blessings from your new Hoosier friend! I first heard Dusten speak at a group meeting I was attending and he is the first medium I have ever consulted personally. I was very impressed by his natural style and integrity in staying focused on what he was seeing from the other side, not allowing individuals in the group to distract him from that at all. I have long enjoyed John Edward on his Crossing Over show and Dusten’s style so reminded me of what I saw there that I felt very strongly I had to schedule an individual reading. The reading exceeded my hopes and expectations, even though I wasn’t that thrilled that two of my busybody aunts are still so involved in my life. LOL!! I also heard from my wonderful second husband and my much missed oldest son who both passed just 10 months apart from each other in 1999 and 2000. I have known that they were together and the messages I received from both of them confirmed many things I had been feeling since they passed. The reading was a great comfort and I have highly recommended Dusten to everyone with any receptiveness to our spiritual perspectives that I have encountered since the reading. Dusten is the real deal–worth every penny spent!! Thank you Dusten for sharing such a warm, empathetic, and interesting visit with me. I sincerely appreciated your time and look forward to knowing you as your grow more completely into your innate talents. I received a reading from Dusten some months ago and found it to be a very valuable experience. He was very insightful regarding my past and present and was right on with his interpretation of my situations. It was very emotional and cleansing experience for me and I highly recommend it for anyone seeking insight and direction. Love you Dusten! Loved my work with you. The clarity and perspective is so helpful. Thanks much. He was spot on. When he was reading for the woman in the bar in the other room which was not a part of our group I was amazed. I had a reading with Dusten recently I was very touch How he takes you down a path you have never went on before but always wanted to so that day I went with Dusten on this walk it was truly Amazing He is for real and right on about your love ones, Its strange I know but on the other hand it is so cool to talk to someone that has excellent insights on your love ones he has a gift that is for sure, He is such a kind and gentle spirit with a sense of humor . I highly recommend him for your Readings ,,,, I feel we have a spiritual Energy working here and you are always with me as I walk my life now. Thank you my friend , Bless you! I just wanted to say thanks to Dusten he hit everything right on! we have now cleared up a couple things we were unsure of when we were there! definitely will do a one on one now for myself ! Again thanks Dusten u are so much fun!!!!!!!!!!! I had a reading with Dustin recently and he is phenomenal!!! Spot on with detail! His personality is wonderful. Such a kind and gentle spirit with a GREAT sense of humor. His gift allowed me to know about family members I never got to meet , but protect me. He brought me comfort and peace and things to keep in check. He’s Indiana’s version of the Long Island Medium. Dusten was fantastic! I have had my fair share of medium readings and this one was so much more detailed than any other. It also just had a feeling of truth about it. As Dusten prefers, I didnt say one thing about anything when I called. He picked up that my issue is finding a will from someone who recently passed and he gave me dozens of pieces of information about the person that were very accurate. He mentioned personality traits and items in her house that are way outside the norm. I would not hesitate to recommend him wholeheartedly, I will definitely use him again. Thanks Dusten for your insight and sharing your gift! Dusten did my natural healing a year ago for my ankle & it is really healing well. I believe in Natural Healing. My cat “Cu Cu” came through & it really made me feel good that he is at a good peacefull place & was here for me when I was lonely. Thank You. Need someone to talk to? Need guidance? Well look nowhere else but your friendly neighborhood psychic Dusten Lyvers!! One of the best I’ve seen especially at his age! I had a private reading with Dusten and he did a phenomenal job! I received answers to questions I had and even more. This experience will help me on my path to healing. I cannot thank you enough Dusten. Great reading! Dustin was so right on, it was amazing. Brought in a family member that other readers have a difficult time recognizing. Wonderful, Wonderful! Dusten had excellent insights and made it a lot of fun with his great spontaneity and humor. I plan to see him again! Dusten, thank you for the reading had a great time…you brought my friend that I miss dearly in..and there was things that you said about him that I only knew,,WONDERFUL READING..For sure I will be taken your advise as well..Love you my dear friend many (((hugs)))) sent ur way..
Dusten is a great medium! He always seems to answer my questions, and sometimes even gives me the answers to questions I don’t even realize that I wanted to know. 🙂 I can’t wait to have another reading with him. If you are unsure or in doubt, please don’t be. I felt the same but Dusten was extremely accurate and very easy to talk to. He did a great job relaying spirits message. The amount of information I received in validation was unbelievable. I would recommend his services to anyone. Seriously, this was the best experience and if I knew it would turn out like this I would have done it many years ago. Thanks Dusten, you’re the best! I’ve had two sessions with Dusten over the past two months; one was a medium reading and the other involved Tarot cards. Dusten was SPOT ON each time. It was amazing. I highly recommend Dusten for the insight he can provide, and the sensitivity he employs. He’s also a lot of fun to spend an hour with; we laugh and share the entire time. I had an amazing reading today! Thanks so much for connecting me to my step-mother! I’ve missed her so much! Dusten just wanted to stop by a say thank you and to tell everyone you are amazing. I contacted Dusten in a time of great need regarding my mother’s health and he was able to schedule an appointment promptly. Thank you for the healing energy you sent to my mother. Dusten was able to tell me what her problem areas were and he was quite spot-on! Not knowing about a certain sickness, he informed me about and not to worry. I was unaware of this problem, but it all came out later to be correct. Dusten is very professional, prompt, compassionate, straightforward fun and easygoing. I can tell that Dusten truly cares about his clients. Previously I had a Psychic reading with him and he amazed me with his knowledge. I am grateful for Dusten and the information he gives on healing and awareness. Dusten, Thank you so much for your reading. I felt all your positive energy from the moment I met you. I was needing some guidance and validation about my life. Id been through a lot in the last 3 yrs; and I need to make sure that I was on the right path. During the reading my grandpa who is no longer with us came through and confirmed and explained; things that had actually happened and even explained how and why they happened. Its been a little over a month and I’m about to have another reading; cause I feel that there was more, we just didn’t have the time. Its truly amazing!! Dusten is the real deal. Lots of validation, which created peace of mind. He’s a gentle soul with a real gift. You are not going to believe this. I just looked up Jonathan (Nick’s friend) obituary and TODAY is the 10th anniversary of his death– February 9, 2006. The first thing you said was “Anniversary” when talking about John. You have an amazing gift and I am blown away! Nick and Andi will be so thrilled to hear from John. It took awhile, but last week I had my physical and my sugar was higher than it’s ever been. Last July in the medium reading you did for me and my daughter to contact her father (my late husband), you said that he warned me about watching my sugar level. I have never had a problem with sugar before. I’m not diabetic, but the fasting glucose was 106. In the past I have always been under 100, just within the normal limit. Also, another huge validation from that reading was a “special clock” that you kept mentioning and also a photo. My daughter found the photo stored away in a box that she always kept close to her heart when she was young of me and her dad holding her as a newborn baby at our church in front of a huge CLOCK. It was special because it wasn’t an actual clock that tells time, it was a “prayer clock” where church members volunteered for an hour to pray every day. The purpose was to have somebody praying 24/7, round the clock. So that solves the clock mystery finally and gives you the validation. Thank you Dusten! She never knew her dad because he passed away when she was 2, but now she feels like she has a dad watching over us from heaven. Dustin you were amazing. You not only gave me so much peace but my friends as well. I don’t know if you remember me, but I was the first sitter you read over skype during the medium cetification with Forever Family. We only had a short 15 minutes but it all meant the world to me. My friend had passed away only a few months before and you were able to channel him. Not only was I at ease after our discussion, but I was able to bring back those messages to his family and friends. Everything you brought up was so extremely on point that I could not sit still. I’ve always been a believer but you certainliy confirmed it. You are a wonderful individual and have so much passion and heart. I left that day not only feeling like I heard from a dear friend, but that I made a friend as well. Thank you for sharing your gifts with the world. Really, thank you. I am extremely lucky to have been a sitter for your test. Best of luck with everything life has to bring you. I had a psychic reading with Dusten Lyvers, not knowing what to expect since I hadn’t had a reading before. Let me tell you, Dusten is a healer. He can bond with people and connect in a way few will understand before meeting him. This is much less about ‘mind reading’ or the future than it is about having a loving guide to let you find yourself. Five stars for a loving first reading! reading last night. You are truly a special person for what you do and are fun and caring and I appreciated your talents last night. I don’t know if you remember, but my mother kept mentioning a mouse or mice. Miss Mouse was my nickname when I was a child. I can’t believe I didn’t make the connection!! Also, my mother insisted that there was a piece of jewelry in her casket. My sister informed me that she put a heart necklace and a note in the casket from her granddaughter! I was truly amazed at how many details you passed to me that were on point. Also, you definitely got my parents characters to a T! Thank you for helping me answer the most important question I had, is there an afterlife. You can’t imagine how much peace that has given me. Thank you again. I anticipate sometime in the future I will want a psychic reading. I have already given your name to some of my friends. I thought you might be interested in a follow up about the silverware–no need to reply. I was telling a close family friend (who was my son’s babysitter the whole time growing up and like a 2nd mom) about the reading and she said that a few days ago (way before the reading) she noticed some spoons missing. She thought her daughter took them when she recently moved out, but she denied it (and the daughter also told me she had not). I also remembered that there was a game she used to play with the kids called “spoons.” It was a card game and you had to grab the spoon if you got 4 of a kind. I think he was trying to play! My reading with Dustin revealed that my grandmother was telling me about a sweater I had been looking for for over a week. The sweater was given to my mom from my grandmother who has passed. My grandmother was just telling me she knew I was looking for it and that I would find it. After I got off the phone with Dustin I started to look for my sweater again and thought since it was cashmere I may have put it in the cleaners and forgotten about it. I had just moved and in all the chaos I misplaced stuff but started to look through my purses for old laundry tickets and found one. I went to the cleaners and when he walked towards me with the purple sweater I felt my hairs raise as I new my grandmother was there with me watching me, even when I looked for it before talking to Dustin. Thank you for sharing your gift and just being so genuine wi with your readings. I have never been a sceptic as I have always felt and known that life is just not here but spiritual, as I have felt others around me. You are simply amazing 🙂 Thank you for sharing your talents with the world. Great class yesterday! I really enjoyed myself and learned alot. Awoke to the rain this morning and immediately blessed the water with a song! Thanks for taking the time to put the info together and for sharing with all of us. Dusten gave me a tarot reading years ago when he was first starting out, and his accuracy was amazing back then! He predicted both positive and negative experiences for me that occurred months later. Dusten is genuine, entertaining, and informative! He will make your money worth it! Hey, thanks to Dusten Lyvers for letting my interview him and the fascinating reading he gave me! It was a very interesting experience, and anyone who gets a reading will not be bored! Be sure to check him out in the new Edition of the IUSB Preface this Wednesday! If you’re looking for a psychic, medium, tarot card reader, etc., look no further! Dusten Lyvers is a very skilled, educated person willing to provide his services for a low cost. Even if you’re a skeptic, you’ll leave a reading with Dusten entertained. C: So try it out! !